Epic landscape painting of the type which helped shape national consciousness in the 18th and 19th centuries is no longer practised, but the work of artist Darren Woodhead, now showing in the Stirling Smith Art Gallery and Museum, has something of the same aim. Darren who has previously been BBC Autumnwatch and Winterwatch Artist-in-Residence, turned his eyes to the Inner Forth over the previous 12 months, aiming to inspire more people to value and celebrate this unique natural and historic landscape through his paintings. This painting, Lapwing tumbling onto Grangemouth mudflats is an ethereal watercolour, painted on 4 October last year and inscribed: Kinneil Lagoons, Stirlingshire, with Grangemouth beyond. Overcast with light westerly wind, feeling mild, 15/16 degrees. Large Lapwing group arriving 0900 with passing Skylark, Goldfinch, few Redpoll, Redwing and Sotted Redshank. Around 1.30 pm, lots of Robin activity. 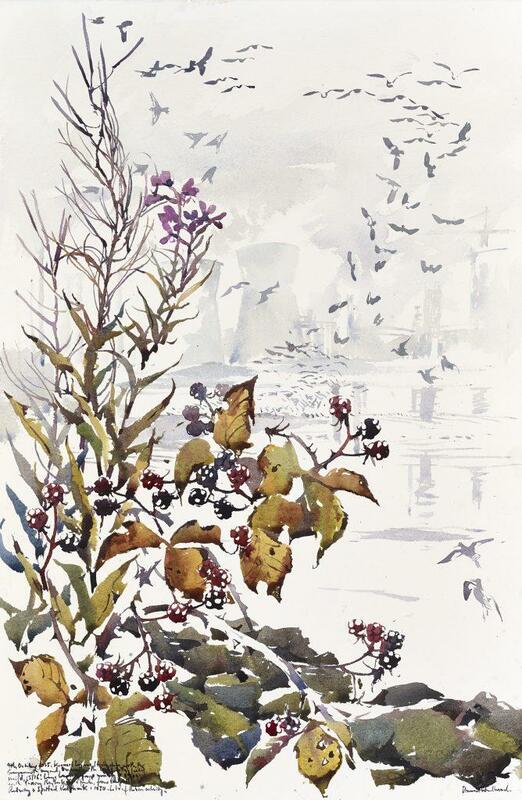 The artist is not only diligent in recording the activity of the birds but in capturing the migrating flight of peewits in mid- air, beside the brambles and the autumn dying back of the vegetation at this lovely time of year. His year as an artist with the Inner Forth Landscape Initiative is coming to an end, and his soaringly beautiful images have captured the natural wealth of the River Forth. See them at the Smith.